As I mentioned before, I’ve been fencing most of my home/office systems (and even lights) these days. The problem is that cheaper power switches like the IP Power 9258 can be damaged quite easily. Two of mine have failed under a particular load element and I’m not saying in that case that it’s not my fault (I still like those units), but it’s clear that having something more “household name” can be a good idea. So I looked on ebay and discovered that old APC Masterswitches now often go for similar money to other more expensive kit. 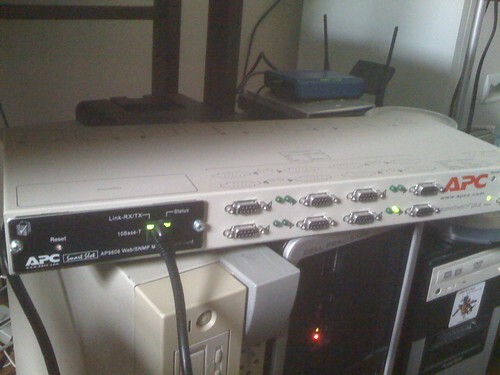 I bought an 8-port Masterswitch Plus (with an AP9606) this week. Previously these went for up to $1000, but can now be had for even a tenth of that much. And they do telnet/SNMP (and ssh, if you upgrade them – not so much of a concern in this particular out-of-band configuration). I looked around for fencing scripts and obviously found the Red Hat Cluster Suite fence_apc stuff but I don’t want to install lots of stuff, and I don’t want to talk over telnet if I’ve got a private SNMP community configured and am reasonably comfortable with that. So I updated my previous script to talk to APC Masterswitch units. APC Masterswitch Plus (with an AP9606) fencing script. Do you constantly get harassed on IRC with “ping?” (insert no context whatsoever here), of course you do. And then you come back later with a bunch of “ping” and no idea what the person wanted. <someone> jonmasters: some useful contextual message here? I know many of you gave up even listening to these contextless “ping” messages years ago (because we’ve spoken about it at some length), or you don’t bother to leave anything connected to IRC if you’re not in front of it, or you just don’t care (hoping that people will learn how to use a computer and try again). But in case you still do care, I would like to share a plugin I wrote for ZNC called “awayping”. Away ping texts (a single line), emails you (full IRC transcripts), and tweets you (by private message) when you are detached or after a configurable idle period. It’s better than simply “autoaway”. Awayping is getting slightly more clever over time, and the new “antiping” feature enhances awayping by also politely educating those who “ping” you (by private message) that leaving a message is infinitely more helpful later than simply 5 “ping”s on the screen. It might also encourage a few people to consider that they could send you email instead. With “awayping”, you can get email or text alerts of pending “ping” messages, and encourage people to use the internet responsibly, so you don’t have to constantly check IRC and can do something more useful instead. Because, let’s face it, they’re just going to email you anyway. I recently registered and setup kernelpodcast.org, where you can find links to the RSS feeds (podcast, and the transcripts), comment, and a lot more besides.